Seriously, what's with everyone hating on brains? They're our most important organ (or, so they tell us), yet in just about every genre film, TV show, comic book or game, the sight of an oversized cranium or a levitating frontal lobe is a sure indicator of malicious intent. At the very least, let us take some time to appreciate the Brain Monsters who have been among us for more than half a century. We've gathered together the best and the brightest. The Metaluna Mutant in This Island Earth (1955) had an encore performance in Mystery Science Theater 3000: The Movie (1996), where it was aptly renamed "Uncle Scrotor." Donovan's Brain by Curt Siomak, and the 1953 movie of the same title, are about an evil millionaire whose brain is put in a vat. Things go awry when Donovan's brain starts to develop telepathic powers, allowing him to control those around him. Attack of the Giant Brain Sucker Monster from Outer Space (2012) is an 18-minute, musical comedy. French writer/director Guillaume Rieu assures audiences that "the film has no hidden depth. It's just a simple homage." 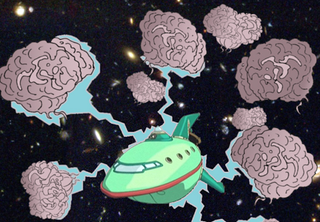 The flying, telekinetic Brain Spawn in Futurama conquer 31st century Earth by making people stupid. (Well, stupider.) The only person immune to their power is Fry, who defeats their overlord, the Big Brain. In Robocop 2 (1990), the psychotic drug dealer Cain gets a second chance at life and mayhem when, after he is critically injured in a crash, his still-living brain (with eyeballs attached) is transplanted into a giant killer robot—because, that always turns out well. MODOK: Acronym for Mental/Mobile/Mechanized Organism Designed Only For Killing. He's a former human altered by scientists to be a super-intelligent analytic agent, but he ended up going rogue. His head is usually drawn larger than the entire rest of his body. He's fought a number of Marvel superheroes, including Captain America and Iron Man. The slug-like Brain Bugs in the Starship Troopers universe are intelligent telepaths who organize and direct the bug swarms. Based on a 1930 short story appearing in Weird Tales magazine, the film Fiend Without A Face (1958) features a scientist who, thanks to exposure to radiation, is able to create a living creature through mental projection. The monsters begin reproducing by killing people and stealing their spinal cords. The Intellect Devourer made its initial appearance in the original, 1977 D&D Monster Manual, where it was described as: "a highly intelligent, chaotic evil, man-sized creature with a body that somewhat resembles a brain. It attacks with its 4 great claws and its psionic ability. It is nearly impossible to kill by most regular or magical means, but is vulnerable to psionic attack." Mindscan is a telepath from the planet Haven and an enemy of the Guardians of the Galaxy. She usually wears a wig to hide her enlarged cranium and (depending on the artist) semi-visible brain. Brainchild, aka "Charles," is a bratty, nine-year-old super villain from The Tick (1994), who built a glass cranium to show off his gray matter. He deserves special mention as one of the best fast-food collectible toys ever: a ball-and-cup game, distributed by Taco Bell. Doctor Who meets Dr. Frankenstein in the 1978 Tom Baker episode, "The Brain of Morbius." Here, the mad scientist is named Solon and he's building a body using spare parts (including a temporary fish bowl head) to house the disembodied brain of the evil Time Lord, Morbius. The Brain from Planet Arous (1957) introduces us to Gor, a criminal who arrives on Earth and possesses the body of a nuclear scientist. Gor is ultimately destroyed with the help of Vol—a "police brain" from planet Arous, who inhabits the body of a dog belonging to the scientist's fiancée. Based on a true story. Krang, the alien super villain appearing in Teenage Mutant Ninja Turtles, was stripped of his body and banished to Earth, where he gets around by means of a humanoid exo-suit built by his ally of convenience, the Shredder. The Spider Mastermind and the Arachnotrons appear in the video games Doom and Doom 2. Not much in the way of character history for these guys. They're just big brains on mechanical spider bodies, shooting at our hero. The monster from the 1988 film Brain Damage is a disembodied brain with a phallic body that attaches itself to the brain stems of human beings, causing euphoric feelings in its hosts. Hector Con Carne, the evil crime lord in The Grim Adventures of Billy & Mandy, was nearly killed in an explosion. His brain was rescued by a scientist and placed into the body of Boskov, a Russian circus bear. The Talosians, the bulbous-headed humanoids in Star Trek, developed mental powers allowing them to create illusions that were indistinguishable from reality. Lactose the Intolerant, who appears in the Adventures of Sam and Max: Freelance Police is a self-proclaimed "custodian of the universe" who dedicates himself to ridding the galaxy of "impurities." One of these impurities is the planet Earth. The Martians from Tim Burton's Mars Attacks! (1996): "Ack ack ack, ack ACK!" Psimon, a frequent opponent of the Teen Titans and Superman, is an evil telepath whose large brain is visible under a transparent skull. Mother Brain, one of the chief antagonists in Nintendo's beloved Metroid series, was the final boss in the original version. The ruler of a race of space pirates, she was originally a disembodied brain in a glass tube, but soon went on to obtain a cybernetic body. The aliens in Invasion of the Saucer-Men (1957) were reportedly the inspiration for Morbo, the TV anchormonster on Futurama. 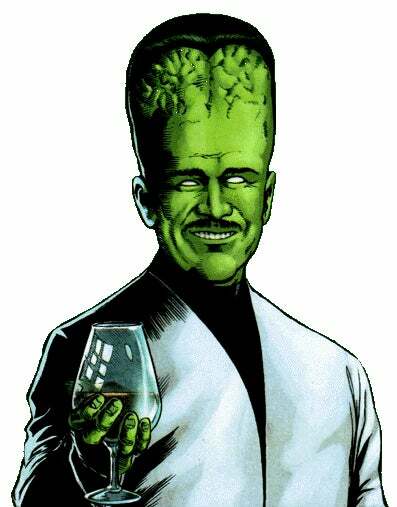 Hector Hammond, a Green Lantern villain, has such an oversized brain that he's often shown confined to a wheelchair from being unable to hold his own head up. Angstrom Levy from the Invincible comic book was horribly mutated after an accident involving the use of a memory transfer machine. He has the ability to open up portals to alternate realities. The Gamesters of Triskelion from Star Trek (1968) are pathetic gambling addicts who get their kicks by exploiting the misery of others. Kind of like Las Vegas, but without magic shows. The Leader, usually pitted against the Incredible Hulk, is a former human mutated by radiation into a green-skinned creature with a massive brain housed in a grotesquely enlarged cranium. The Brain, from the DC Comics universe, used to be a scientist conducting experiments on animals. When a jealous colleague arranged for him to be killed in an explosion, his body was destroyed but his brain survived. At this point, the brain was rescued by Monsieur Mallah, a super-intelligent gorilla (and result of the scientist's earlier experiments), and the duo went on to form the nefarious Brotherhood of Evil. In Grant Morrison's later version of Doom Patrol, the origins were changed somewhat and Mallah and the Brain fall in love.